Cataloochee is basically three narrow valleys surrounded by the Balsam Mountains on the North Carolina side of the Great Smoky Mountains. Sterling Ridge is to the Northwest, while the Cataloochee Divide is to the southeast. These valleys stand above 5,000 feet. Continuing southwest is Big Cataloochee Mountain which stands 6,155 feet. The Cataloochie area was considered at one time to be a hunting ground owned by the Cherokee Indians. The name comes from the word Gadalutsi meaning "stand erect." Some believe it was named for the tall trees that surround the valley. Cataloochie trail stretched from Cove Creek all the way over into a small valley in Tennessee known as Cosby. Overhill towns were connected by Cherokee Middle settlements. In 1810 Bishop Frances Asbury used this trail to hike cross the mountains and go into Tennessee. By the time European explorers got here, this trail has been worn a foot deep in some places. In 1791 came the Treaty of Holston. Along with it came giving up the claims to this land by the Cherokee Indians to the first Euro-American settlers. These folks spoke fluent Cherokee and remained on friendly terms with them. As a result, the Indians continued to hunt and fish on this land throughout the 19th century. Cook Cabin - Built in 1850's. Dismantled in 1970's after vandalism and restored in 1999. Caldwell house - Dates back to 1898-1903 with barn not added until 1923. Steve Woody House - Originally built of logs in 1880 and located along the Rough Fork Trail. Little Cataloochee Baptist Church - built in 1889 and included a bell. Messer Barn - Built in 1905 from Little Cataloochee to a ranger's residence where it now stands. Cataloochie Churches - This area had two church structures. The Little Baptist Church was built during the year of 1889. This church was also referred to as the Ola Baptist Church. Later came a belfry built by Will Messer. It included a bell donated by William Hannah. There's a spiritual feel as you enter the church. It's easy to imagine the old time religion as folks worshiped our risen Savior. An old Bible still sits upon the podium where the pastor once stood. Palmer Chapel Methodist Church was built around 1898. It's stands beautifully in a picturesque area with a structure that has been well maintained. It's lovely interior includes old-time wooden benches, an original podium with a beautiful large cross on the wall in the background. The Chapel sits on land deeded by Mary Ann Palmer The church is located near Beech Grove School in Waynesville, North Carolina. The campground is located at the junction of Caldwell Fork and Cataloochee Creek. Backcountry sites are found along Caldwell fork Trail, Rough Creek Trail , and Pretty Hollow Gap Tail. Camping here offers several types of sites. For the backpacker there's BACKCOUNTRY packing that requires hiking for several miles to the site. FRONTCOUNTRY is camping near the car. This campground has running water, toilets, fire grates, and picnic tables. HORSE CAMPS are small campgrounds you drive into. They offer hitch racks for horses, and primitive camping facilities. GROUP CAMPGROUNDS are located in the frontcountry and offer accommodations for groups of eight or more. 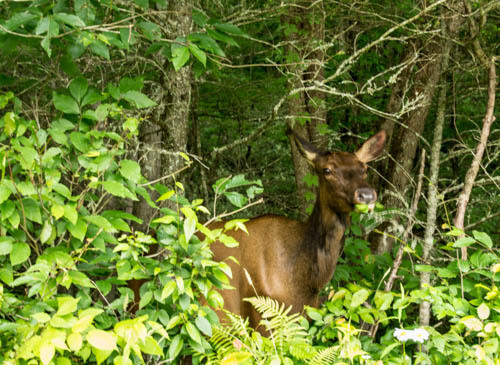 THE ELK brought celebration to the area in February 2001 as 25 of these beautiful animals were reintroduced and released into the area. The Rocky Mountain Elk Foundation provided $700.000 of the $1.1 million cost. 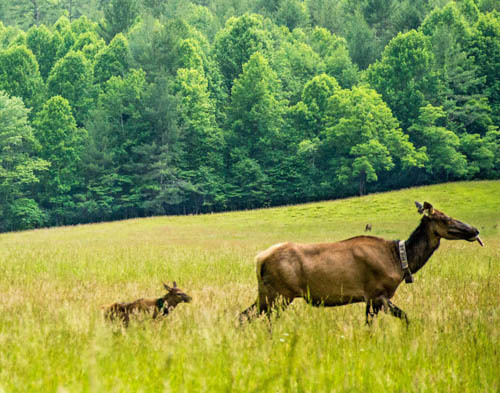 The elk once lived in Southern Appalachia, but due to over hunting and loss of habitat they did not survive. Now these wild animals roam the valley where people flock to see them mainly in the Spring and Fall. There was a calving season among the elk in 2011 which brought the population to more than 130 Elk. You can read more about the release of the Elk and their history at romanticashevillecatallochee.com The Smoky Mountains of North Carolina are extraordinarily beautiful during every season of the year! 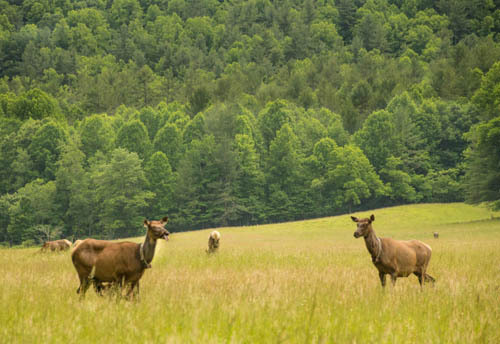 Driving over the winding roads that take you to Cataloochee is an experience within itself!. Arriving into this historical valley where the Elk run free make this area a sight to see!